A concept drawing of the Warradale skate and BMX park. 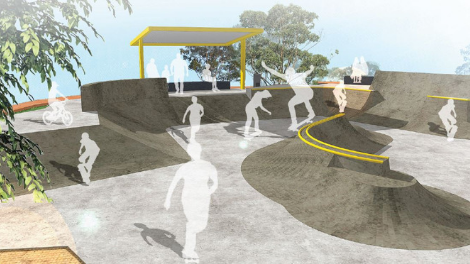 The community consultation outcomes for a new skate and BMX facility at Warradale Park in Landsdale were tabled, with almost 90 per cent of more than 100 respondents directly supporting the concept design. The City will now apply for an external grant to assist with funding the project, and detailed design will take place prior to the facility going out for tender later this year. In the north, a new sports amenities building is a step closer for Leatherback Park, Alkimos. Council endorsed the concept design for the building, that is set to include change-rooms, storerooms, first aid room, kitchen/kiosk with external servery, multi-purpose room, umpires’ room and male, female and accessible toilets. The park is a shared use oval with Alkimos Beach Primary School and is used by the Alkimos Pirates Lacrosse Club, Alkimos Ball Club and Brighton Seahawks Football Club. During the community consultation for this project the City liaised with each of the clubs in addition to residents within a 400 metre radius of the park. Construction is expected to begin in March 2020 and be completed by October 2020. Mayor Tracey Roberts thanked the members of the public who took the time to give their feedback during community consultation for both projects. “We are a listening council and we recognise the importance of hearing what our community have to say about projects in their own backyard,” Mayor Roberts said.